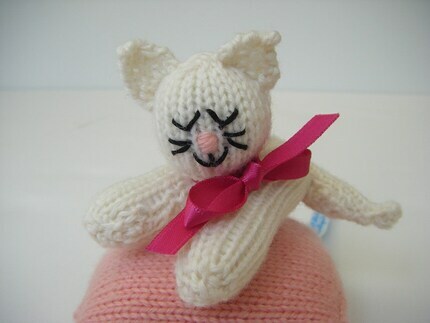 This lucky white cat sits on a pretty pink cushion. All Woollywotnotsâ€™ collectables are made in a smoke-free, pet-free environment. The cat and cushion are stuffed with a high grade carded polyester filling which conforms to British standards: cleanliness BS 1425 and fire safety BS 5852. It is a suitable component of articles requiring BS 5665 and the European standard EN71 and those required to carry the CE logo. It is soft with no sharp parts. The cat and cushion can be made to order in the colours of your choice. Not suitable for young children without the supervision of an adult. Folksy :: Buy " Proud Mum and her Kitten"